The annual J.P. Morgan Healthcare Conference is the largest and most informative healthcare investment symposium in the industry, bringing together industry leaders, emerging fast-growth companies, innovative technology creators, and members of the investment community. What is the equivalent of the Nobel Prize in computing and who was recently awarded it? Is machine learning enough – why or why not? Why can’t you use data for causation? Why now is the perfect time to combine reasoning computing with life science? If data is rock what is knowledge? 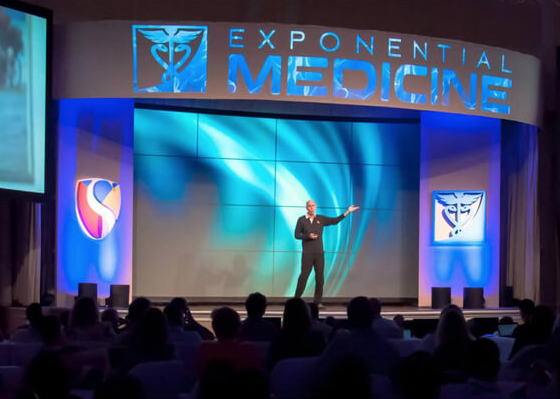 Exponential Medicine is a unique and intensive four-day experience that gathers world-class faculty, innovators and organizations from across the biomedical and technology spectrum to explore and leverage the convergence of fast moving technologies in the reinvention and future of health and medicine. KEYNOTE: "How AI Will Change Funding Opportunities for Biotech Entrepreneurs"
AI is already part of our everyday life through search engine, social media, smart phones apps, self-driving cars…, but what about Life Sciences and how to connect the dots between AI expertise, Biotech startups, and Funding to accelerate researches and develop new market opportunities. About LaunchBio: LaunchBio is a nonprofit organization that identifies, counsels, and supports high-growth, high-impact life science and biotechnology companies. Its mission is to build an ecosystem of innovation for the benefit of human health and well-being. LaunchBio’s impact is measured by its success in connecting entrepreneurs with knowledge, capital and talent – including each other – not only within geographic regions, but across the nation’s leading life science hubs. STARTS IN BUILDING 3 - ROOM B.
ThinkingNode CEO/Founder, Khai Pham will be speaking at 11:45 am: "Potential for AI in Blockchain"
Join us for a one-and-a-half day workshop conducted by UC San Diego in collaboration with IEEE San Diego Chapter and IEEE Standards Association. This educational workshop will feature a combination of lectures, use cases, applied skill learning and panel discussions from leading experts focused on key healthcare verticals including genomics, the health supply chain, clinical trials and medical devices. The Digital MedTech Conference is proud to partner with MedTech Innovator to host its Digital Pitch Event during the conference. Eight outstanding digital health companies will present and receive feedback from a panel of expert judges. The top companies will move on in this year’s $500,000 MedTech Innovator Competition and Accelerator. "Why 'Reasoning Computing' is the Next AI Market"
"Reasoning Computing for Biology and Medicine"
SHOW DESCRIPTION: Khai Pham, Founder & CEO, Thinking Node Inc joins Bob to discuss how in 1995, he founded DataMind, a leading data mining company using an Agent Technology coming from his research in Artificial Intelligence (AI). It was used by major financial institutions, marketing centers, and medical manufacturers. Oracle and Infor acquired the technology to integrate it into their solutions. In 2012, Bank of America acquired the technology US patent. Later renamed RightPoint, the company acquisition value is one of the highest for an AI-based company, it was acquired in 2000 by E.piphany for US$400 Millions.